It’s true that with age your body starts reacting differently. Although, you cannot turn the clock back you can always choose to age well. There’s no magic formula for that. However, following an active and healthy lifestyle can help you age well. There is a lot that you can do to stay healthy as you age. Sugar intake increases the total calories you consume and as a result, it can trigger weight gain. Unhealthy weight gain can increase the risk of developing cardiovascular diseases. It also increases the risk of diabetes. Cut down on your consumption of sugar-sweetened beverages, cakes, cookies, fruit drinks (that are available in the supermarket), candy, ice cream, ready to eat cereals etc. Regular exercise plays a key role to boost physical as well as mental health. By staying active you can keep your bones and joints (that tend to get stiff with age) healthy. As a result, you can stay independent and do your own activities. Also, staying active keeps you away from common chronic conditions such as diabetes, depression, heart disease, and arthritis. Avoid heavy workout. Go for a walk or try yoga. Consult your doctor and your trainer before deciding what works best for you. Older adults need as much sleep as the younger adults. You must get at least 7 to 8 hours of sleep every day. Lack of sleep often results in depression, increase irritability, and result in memory problems. If you are not getting enough sleep, try developing a regular schedule and a regular bedtime routine. Keep the bedroom dark. Avoid watching television before bedtime to enjoy a sound sleep. As you age, your ability to deal with stress also changes. Long-term stress can cause great damage to brain cells. Stress may also result in fatigue, memory loss, and affect your immune system. While it’s impossible to completely avoid the effect of stress but you can always manage stress. Talk to a close friend or a loved one when you are stressed. Often, talking to near and dear ones about your problems is comforting. Try yoga, meditation, and other relaxation techniques. Remember, you may not change the situation but try to adapt to things that are beyond your control. Eating healthy is not just eating more of everything. In fact, it’s quite normal to eat less as you grow older. It’s because your physical activity lessens with age. Your energy needs also decrease and as a result, your food portions also come down. Also, you tend to lose muscle when you age. So, it’s not just about how much you eat but what you eat. Choose a healthy diet. Whole grain food items contain B vitamins, iron, folic acid, and copper. These food items lower risks of cardiovascular diseases and type 2 diabetes. Moreover, they help in maintaining your good digestive health. Choose brown rice and whole grains over their white counterpart. Include oats in your breakfast. Lack of fruits and vegetables in your daily diet means you are lacking all the essential nutrients, vitamins, minerals, and fibre. What you can do is, set a goal of having two fruits and vegetables daily. Meat, fish, dairy products, and beans- all are rich in protein. These are essential for the maintenance and repair of your body tissues. Lack of protein will slow down the repair of your worn-out tissue. This can result in delayed healing of wounds, thus making you more vulnerable to infections. Meat is also an excellent source of zinc, Vitamin B, selenium, iron, and phosphorus. Choose lean meat, fish, eggs, and poultry for meeting the required protein intake. In case you are vegan then you can eat tofu, legumes, and beans to meet your protein needs. These are excellent sources of protein, loaded with fibre and are very low in fat content. Calcium gives structural strength to your bones, thus providing the much-needed support to your body. Lack of calcium increases the risk of osteoporosis, making your bones weak and brittle. To increase your daily intake of calcium you may include dairy products such as milk, cheese, and yoghurt. These are rich sources of calcium. You will also find Calcium in almonds, tofu, sardines and other fish that have edible bones, and dark green leafy vegetables. Avoid taking more salt than the daily measure. Talk to your doctor to determine the amount of salt that you can have on a regular basis. Stick to that. Controlling your sodium intake helps in reducing the risk of high blood pressure, and other associated ailments. Give instructions for putting less salt in your food. Avoid taking sauces, cookies and other baked goodies. Always limit your use of salt and other seasonings in food. Use only natural herbs and spices such as onion, garlic, and ginger for flavouring your food. Avoid eating food with preservatives such as salted veggies, salted meat, fish, and salted nuts. Your body needs water for regulating the body temperature, for eliminating waste from the body and for maintaining blood pressure. Avoid drinking sugar-sweetened drinks. Instead, always go for plain water. Talk to your doctor about what should be your ideal water intake (litres per day) and then stick to that. It’s because nuts contain healthy fats and fibre. They are rich in antioxidant; help lower bad cholesterol levels and the risk of heart disease. Also, these are healthy snack options. Older adults are prone to cognitive impairments. It’s because with age the brain functions tend to decrease. Indulge in activities that can stimulate your cognitive abilities. Never stop learning. Keep challenging your mind. Join a hobby a club. Learn a new language, read a book or learn to play any musical instrument. These tips can be easily incorporated into your daily lifestyle. You do not need to do everything at once but take one small step at a time. It’s because Ayurveda brings to you the richness of the herbs and medicinal plants that help in keeping your body healthy. 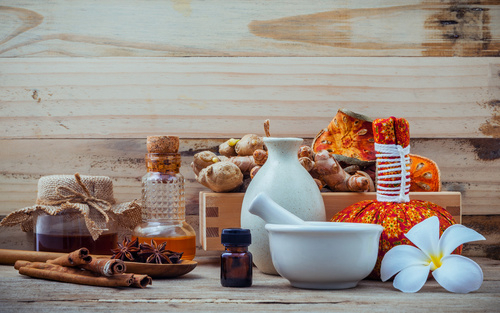 Ayurvedic medicines are made using herb extracts and thus, are devoid of any kind of chemicals.